Habitat and ecology: This species grows in the summer rainfall area of Eastern Cape in coastal scrub and forest. Description: The forest lily flowers (Veltheimia bracteata) is a perennial bulbous plants forming clumps of shiny, dark-green, broad and wavy-edged leaves. The inflorescence is a dense raceme up to 45 cm tall of tubular, drooping flowers that appear in early spring. The colour of the flowers is variable, and could be pale pink, dusky pink, orange-pink or deep rose pink, and at times greenish-yellow too. The tips of the flowers are sometimes green or spotted with green. Derivation of specific name: This member of the Hyacinthaceae family was given this name honor of a German patron of botany, August Ferdinand Graf von Veltheim (1741-1801). Bulb: Broadly ovoid long necked, about 7 x 6cm with fleshy scales. Leaves. 8-12, glossy green on both surfaces, fleshy, broadly strap-shaped, oblong,10-35 cm long, 5-10 cm broad, narrowed gradually from the middle to the base with crisped or wavy margins. The leaves form an approximately 25 cm high by 35 cm wide rosette at the base of the flower stem. 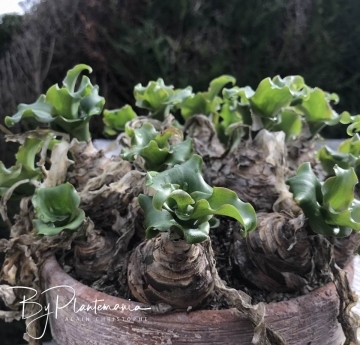 Veltheimia bracteata is winter-growing, the leaves dying back in summer, and the new leaves appearing in late-summer to autumn, after a short period of dormancy. In frost-free regions that have rainfall throughout the year, Veltheimia bracteata is almost evergreen. Inflorescence: The single flowering shoot, as with many bulbs, appears from the centre and will reach a height of 45(-60) cm. Peduncle (scape) about 30-45 cm long dark purple finely spotted with yellow, fleshy. Raceme 7.5-12.5 cm long and dense. Pedicels nearly or quite obsolete. Bracts lanceolate-acuminate, as long as or a little longer than the flower. Flowers: Numerous. up to 60 held upright when in tight bud and pendent when open. Perianth tubular 3-4 cm long, pale pink, dusky pink, orange-pink or deep rose pink, or greenish-yellow, about an 25 mm long. Segments 4-6 mm long, the tips sometimes green or spotted with green. Stamens half as long as the perianth. The flowers are bird pollinated. Blooming season: This species flowers during late winter to spring (July to October) and each flower-head lasts about a month. Fruits capsules: Membranous, large, inflated, narrowly obovate in profile, conspicuously 3-winged, dry and papery at maturity, usually during mid-summer. Seeds: Black, pear-shaped, about 6 mm long. 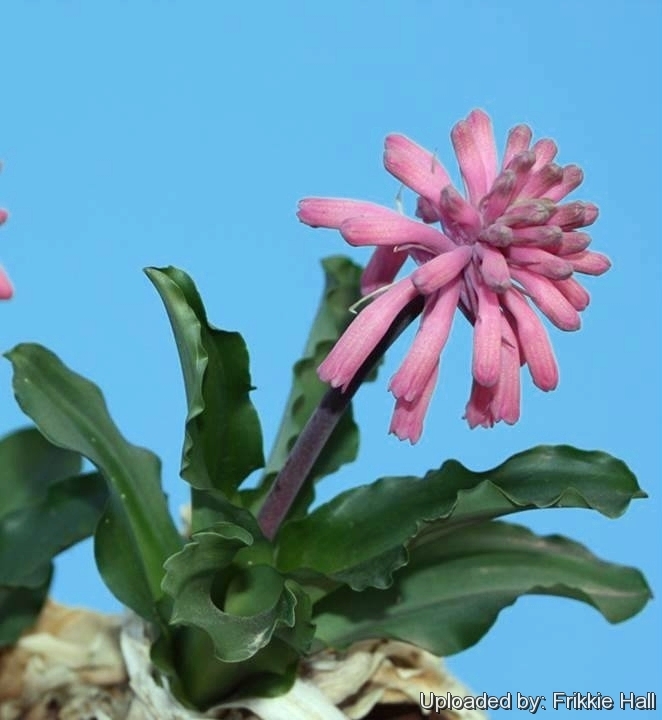 Taxonomy note: There are only two species in this genus, the other being Veltheimia capensis, the sandlelie (sand lily) or quarobe. Veltheimia bracteata 'Lemon Flame' is a greenish-yellow flowering form of the species. Veltheimia viridiflora hort (Hortulanorum, meaning 'of gardeners') is a name known in cultivation by garders that, in accordance with international rules, should now correctly be called Veltheimia bracteata. 3) Baarnhoorn, F, “Growing Bulbs in Southern Africa”, Southern Book Publishes 1995. 4) Bryan, J, “Bulbs Volume II,” I-Z, Christopher Helm Publishers1989. 6) Duncan, G, X “Growing South African Bulbous Plants”, National Botanical Institute 1996. 7) Joffe, P, “The Gardeners Guide to South African Plants”, Tafelberg Publishers 1993. 8) Mathew, B, “Growing Bulbs”, B.T. Batsford Publishers 1997. 9) Pienaar, K, “Gardening with Indigenous Plants”, Struik Timmins Publishers 1991. 10) Rix, M, “Growing Bulbs” Timber Press1983. 13) Mabberley, D.J. “Mabberley’s Plant-Book” Cambridge, 2008. 14) Pooley, Elsa. “Wild Flowers KwaZulu-Natal and the Eastern Region”. Natal Flora Publications Trust 1998. 15) Stearn, William T. “Stearn’s Dictionary of Plant Names for Gardeners”. Cassell. 1993. 16) Walters, S.M. et al. “The European Garden Flora”. Cambridge 1986. 17) Curtis’ Botanical Magazine 501(1799) et. in n.s. t. 215 in 1953. 19) Brickell (ed.). “RHS A-Z encyclopedia of garden plants”. 1068 (2003). Cultivation and Propagation: Veltheimia bracteata delights in rather damp growing conditions and is suitable for growing in the shade under trees and shrubs and under glass. This is the more robust of the 2 species and the easier to cultivate. It stays in growth most of the year and therefore does not require a dormant period. Veltheimias make good house plants and will flower in the winter months. Veltheimia bracteata is a beautiful bulb, with a moderate to fast growth rate. Water requirements: This species grows in moister areas of Cape Province it should be watered all year round, unlike Veltheimia capensis which is from the Mediterranean climate zone. Soil: It requires a well drained rich soil, with the bulbs planted on the soil surface, and left undisturbed for many years. It does best in acid to neutral, humus-rich, loamy soil. Fertilization: A general purpose slow release granular fertilizer and/or seaweed derived liquid fertilizer can be used during the growing season. Exposition: The forest lily is easily cultivated and grows well in semi-shade or shade. Temperature requirements. It does not tolerate severe frost, but will be unharmed by light frost where it is protected from the early morning sun, by for example overhanging branches. Propagation: They should be re-potted every 2-3 years when the young bulbils can be removed and potted on. Offsets should be removed in summer when the foliage has died down and replanted immediately, 30 - 40 mm deep. If grown in a pot the bulbs can be lifted every two to three years to remove the offsets from the parent bulb. These new bulbs should flower after one season. Like other bulbous plants they can be grown from seed but this takes 3-4 years to produce flowering plants. . Germination takes two to three weeks and the seedlings should be fed with dilute liquid fertilizer every two weeks after germination. The seedlings generally take three to four years to flower, and can be set out in the garden at the beginning of their third season, during which some may flower for the first time. It can also be propagated by leaf cuttings. The leaf of a well-established plant can be removed, planted in a sandy soil mix, and bulblets will form at the base of the leaf.